In the computing world, some things are worth paying for, and others aren’t. For years, I’ve put antivirus and antispyware software in the not worth paying for category. My current favorite free security program is Microsoft Security Essentials. 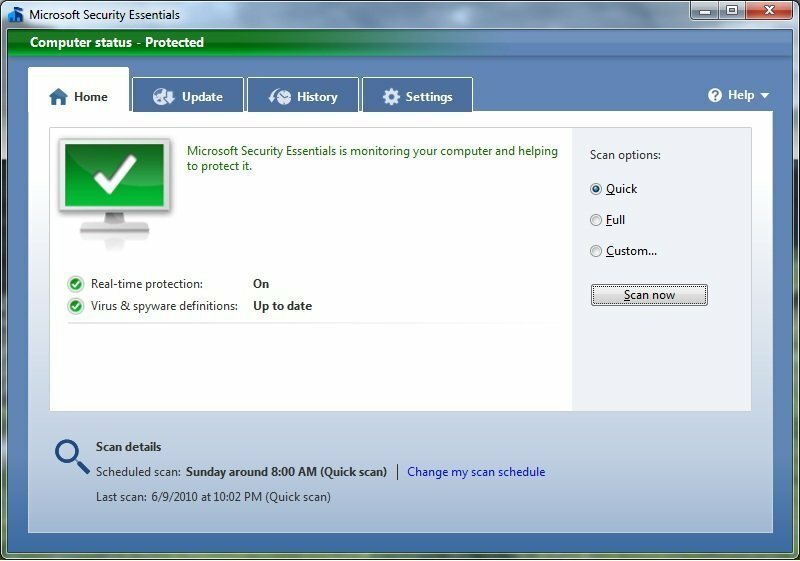 Microsoft released Microsoft Security Essentials (MSE) in 2009, but its roots go back to an acquisition in 2003, followed by Windows Live OneCare, a paid program released in 2006. In its current incarnation, MSE has shown better than average malware detection rates, and is certified by ICSA Labs, West Coast Labs, and Virus Bulletin. It has also done well in several recent AV-Comparatives tests of proactive detection, on-demand protection, and performance. I prefer MSE over my previous free favorite, Avira AntiVir, for its overall simplicity. MSE installs quickly, updates itself automatically, and doesn’t make a lot of “noise”. It offers real-time scanning (scanning files as you download or use them) and on-demand scanning (scanning files or your entire PC at your request). I still like AntiVir for its speed and detection rates, but the program is a little more complicated, and the free version displays a popup ad each time it updates. I suggest you use Microsoft Security Essentials as your security software for Windows XP, Vista, and Windows 7. Of course, technology is always a secondary defense against malware; your behavior is always the primary defense. I will examine this anti-virus for myself because i’ve heard so much regarding this. Thanks for the wonderful explanation!